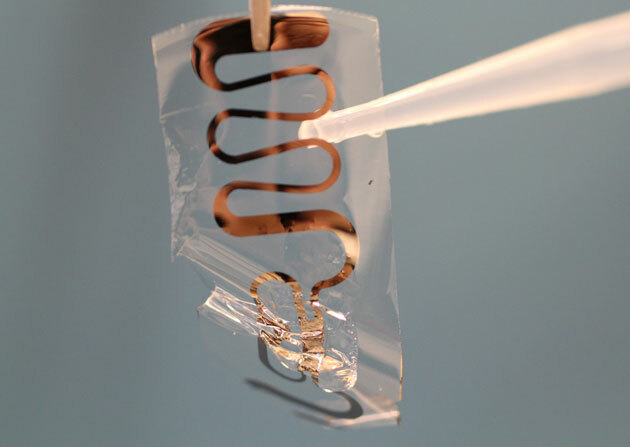 A water soluble radio-frequency identification (RFID) tag that can melt away in a matter of minutes has been developed in John Rogers' lab at the University of Illinois at Urbana-Champaign in the US. Rogers presented the work at the 247th ACS National Meeting & Exposition in Dallas, US.RFID tags are widely used for tracking consumer products, livestock and people – billions are produced each year. Most end up in landfill after a short period of time, but Rogers' team have developed a prototype that could be easily recycled or reabsorbed into the environment once discarded. 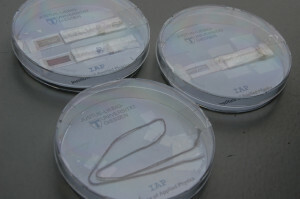 The work is part of a broader project to develop 'transient' electronics. In the past, the group have made dissolvable medical implants that don't require surgery to retrieve, and they are currently working on a biodegradable battery. Now researchers at Harvard’s Wyss Institute for Biologically Inspired Engineering have introduced a new bioplastic isolated from shrimp shells. It’s made from chitosan, a form of chitin, the second-most abundant organic material on Earth. Chitin, a tough polysaccharide, is the main ingredient in the hardy shells of crustaceans, the armorlike cuticles of insects, and even the flexible wings of butterflies. The Wyss Institute makes its shrilk from chitin from shrimp shells, most which would otherwise be discarded or used in fertilizer or makeup, and a fibroin protein from silk. Researchers discussed it in a March online study in the journal Macromolecular Materials & Engineering. Shrilk is cheaply and easily fabricated by a novel method that preserves chitosan’s strong mechanical properties. The researchers said that for the first time, this tough, transparent, and renewable material can be used to make large, 3-D objects with complex shapes using traditional casting or injection-molding techniques. That means objects made from shrilk can be mass-manufactured and will be as robust as items made with the everyday plastics used in toys and cell phones. Rapid prototyping has become an integral part of planning and production processes in a variety of disciplines. They enable the rapid and direct assessment of essential planning steps and the industrial production of personalized products. For additive printing methods, the use of support materials for overhanging parts of the object lead to increased material costs that are to be minimized in this project. A new approach to harvesting solar energy, developed by MIT researchers, could improve efficiency by using sunlight to heat a high-temperature material whose infrared radiation would then be collected by a conventional photovoltaic cell. This technique could also make it easier to store the energy for later use, the researchers say. 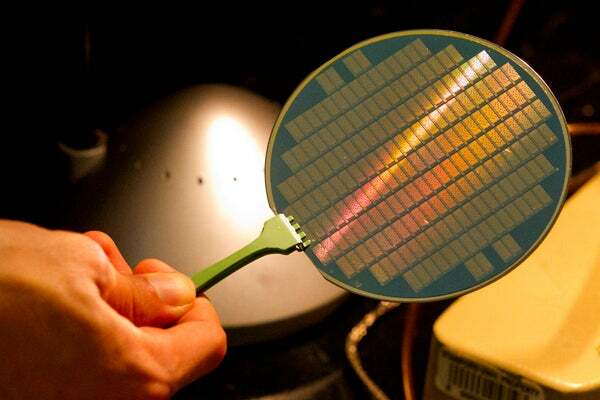 A nanophotonic solar thermophotovoltaic device composed of an array of multi‑walled carbon nanotubes as the absorber, a one‑dimensional silicon/silicon dioxide photonic crystal as the emitter, and a 0.55 eV photovoltaic cell. Macromolecular networks consisting of homogeneously distributed covalently bonded inorganic and organic precursors are anticipated to show remarkable characteristics, distinct from those of the individual constituents. A novel hyper-cross-linked ultrathin membrane is presented, consisting of a giant molecular network of alternating polyhedral oligomeric silsesquioxanes and aromatic imide bridges. The hybrid characteristics of the membrane are manifested in excellent gas separation performance at elevated temperatures, providing a new and key enabling technology for many important industrial scale applications. Stimuli-responsive devices are of great scientific interest for data-processing applications, such as redox-based Boolean logic gates. Now, Bruno Fabre, Institut des Sciences Chimiques de Rennes, and Han Zuilhof with co-workers in Wageningen University, have developed a novel all-solid AND logic gate which responds to non-chemical inputs irradiation (light) and applied electrical potential. Inspired by the human brain, IBM has developed a computer which runs on what it calls 'electronic blood'. The prototype computer, which uses only 20W of energy, relies on an electrolyte liquid to carry power in and take heat out. IBM's ultimate goal, according to researcher Dr Bruno Michel, is to put a petaflop computer into a desktop pc by 2060. Introducing an innovative atmospheric pressure roll-to-roll CVD process to help electronics manufacturers produce graphene films in large quantities at low cost for use in displays, touch screens, and thermal management solutions. Two independent groups of researchers have demonstrated graphene-based membranes that can separate gas molecules according to their size and shape. One of the membranes separates hydrogen from nitrogen and carbon dioxide, while the other membrane separates carbon dioxide from nitrogen, and could be used in carbon capture processes to curb greenhouse emissions. Graphene — which consists of atom-thick sheets of carbon atoms arranged hexagonally — is the new wonder material: Flexible, lightweight and incredibly conductive electrically, it’s also the strongest material known to man. A team of Stanford engineers has built a basic computer using carbon nanotubes, a semiconductor material that has the potential to launch a new generation of electronic devices that run faster, while using less energy, than those made from silicon chips. The first commercial 3-D bioprinter, Organovo's NovoGen MMX Bioprinter, is manufacturing functional liver tissues that will soon help biochemists test new drugs. Imagine if all the windows of a building, and perhaps even all its exterior walls, could be put to use as solar collectors. Soon, you may not have to imagine it, as the Norweigan solar power company EnSol has patented a thin film solar cell technology designed to be sprayed on to just such surfaces. Unlike traditional silicon-based solar cells, the film is composed of metal nanoparticles embedded in a transparent composite matrix, and operates on a different principle. EnSol is now developing the product with help from the University of Leicester's Department of Physics and Astronomy. 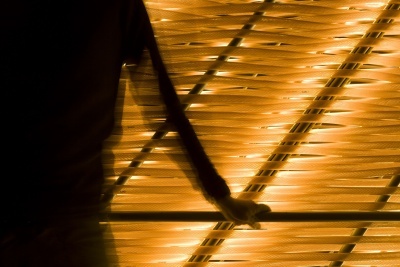 New plastic becomes stronger when stressed. High shear stresses are known to trigger destructive bond-scission reactions in polymers. Recent work has shown that the same shear forces can be used to accelerate non-destructive reactions in mechanophores along polymer backbones, and it is demonstrated here that such mechanochemical reactions can be used to strengthen a polymer subjected to otherwise destructive shear forces. Polybutadiene was functionalized with dibromocyclopropane mechanophores, whose mechanical activation generates allylic bromides that are crosslinked in situ by nucleophilic substitution reactions with carboxylates. The crosslinking is activated efficiently by shear forces both in solvated systems and in bulk materials, and the resulting covalent polymer networks possess moduli that are orders-of-magnitude greater than those of the unactivated polymers. These molecular-level responses and their impact on polymer properties have implications for the design of materials that, like biological materials, actively remodel locally as a function of their physical environment. Ultra-High Strength Metamaterial Developed using Graphene. New metamaterial has been developed exhibiting hundreds of times greater strength than pure metals. Professor Seung Min, Han and Yoo Sung, Jeong (Graduate School of Energy, Environment, Water, and Sustainability (EEWS)) and Professor Seok Woo, Jeon (Department of Material Science and Engineering) have developed a composite nanomaterial. In the search for clean, green sustainable energy sources to meet human needs for generations to come, perhaps no technology matches the ultimate potential of artificial photosynthesis. Myrifilm® is a bio-based, ultra low odor, broad spectrum coalescing solvent. Because it is zero-VOC (as measured by ASTM D6866), Myrifilm allows the formulation flexibility needed to meet increasingly stringent environmental compliance regulations. 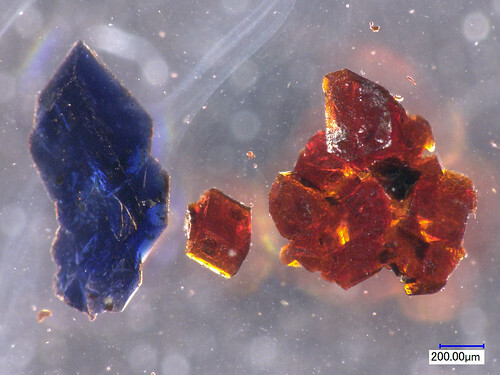 Chemists have unexpectedly made two differently colored crystals - one orange, the other blue - from one chemical in the same flask while studying a special kind of molecular connection called an agostic bond. The discovery, reported in Angewandte Chemie International Edition on July 29, is providing new insights into important industrial chemical reactions such as those that occur while making plastics and fuels. A sponge-like cotton fabric autonomously collects and releases water from fogs triggered by typical day-and-night temperature variations. The reversible switching between absorbing-superhydrophilic/releasing-superhydrophobic states results from structural changes of a temperature-responsive polymer grafted on the very rough fabric-surface. This material and concept presents a breakthrough into simple and versatile solutions for collection, uni-directional flow, and purification of water captured from the atmosphere. Yang, H., Zhu, H., Hendrix, M.M.R.M., Lousberg, N.J.H.G.M., With, G. de, Carvalho Esteves, A.C. de & Xin, J.H. (2013). Temperature-triggered collection and release of water from fogs by a sponge-like cotton fabric. Advanced Materials, 25(8), 1150-1154. Audi, Philips, Automotive Lighting, Merck and the University of Cologne successfully concluded an OLED research project (called OLED 3D), and developed the world's first large-area 3D OLED car rear lighting panels and installed a prototype on an Audi TT. Local architects Churtichaga + Quadra-Salcedo have turned a run-down space into a hip hideaway using a surprisingly simple strategy, and to great effect. Long lines of plastic tubing run through the interior of several of the building's more dramatic spaces. Staircases, halls and the large theatre space are adorned with the plastic, which is woven in horizontal lines to achieve a faintly abstract effect of soft space. 10 years ago! The Laban Contemporary Dance Centre lies in Deptford near Greenwich, outlined by the Thames, designed by Herzog & de Meuron. A translucent polycarbonate cladding wraps around a colored exterior wall layer to create a glowing, permeable object. Trinity Laban Conservatoire of Music and Dance is the UK’s only conservatoire of music and contemporary dance. Leaders in music and contemporary dance education, we also provide exciting opportunities for the public to encounter dance and music, and access arts health programmes. The unequalled expertise and experience of our staff and our world-class facilities are housed in landmark buildings. FogQuest is a non-profit, registered Canadian charity dedicated to planning and implementing water projects for rural communities in developing countries. We utilize innovative fog collectors as well as effective rainfall collectors to make optimum use of natural atmospheric sources of water. The Solar Fiber project was conceived in May 2012 during Ideas Waiting to Happen, an initiative by Creative Cities Amsterdam Area (website in Dutch), Digiluce and Doe Het Niet Zelf (website in Dutch). Ideas Waiting to Happen brings together scientists, designers, artists, technologists and makers with the goal of fostering innovation. The four day event was sponsored by L&P Group and Philips, who provided prizes as extra motivation to the innovators. Solar Fiber won the first prize of development money and support from L&P Group. There were a lot of great ideas resulting from this initiative, so we feel very lucky to have won. Aniela has a more detailed write-up on her site that's worth checking out. Smart Highway are interactive and sustainable roads of today. 3D Systems is committed to providing great technology and choice in 3D printing. From the beginning we have focused on understanding and eliminating the barriers to broad utilization. Today we are working on a multi-front strategy to democratize access and accelerate the adoption of 3D printing by the student, the hobbyist and the consumer. 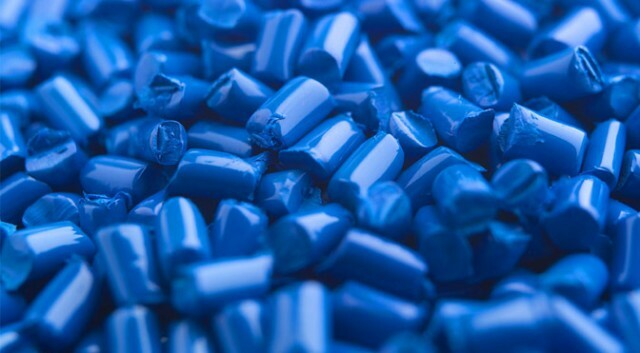 With the world’s focus on reducing our dependency on fossil-fuel energy, the scientific community can investigate new plastic materials that are much less dependent on petroleum than are conventional plastics. Given increasing environmental issues, the idea of replacing plastics with water-based gels, so-called hydrogels, seems reasonable. Here we report that water and clay (2–3% by mass), when mixed with a very small proportion (<0.4% by mass) of organic components, quickly form a transparent hydrogel. This material can be moulded into shape-persistent, free-standing objects owing to its exceptionally great mechanical strength, and rapidly and completely self-heals when damaged. Furthermore, it preserves biologically active proteins for catalysis. So far no other hydrogels, including conventional ones formed by mixing polymeric cations and anions or polysaccharides and borax, have been reported to possess all these features. Notably, this material is formed only by non-covalent forces resulting from the specific design of a telechelic dendritic macromolecule with multiple adhesive termini for binding to clay [Nature 463, p. 339-343 (21 January 2010)].